We feel he would really like to see some type of large consolidated agreement at the Paris Climate Conference later in '15. He is being helped a bit by the Chinese government's attempts to curb their pollution a bit we feel to prevent mass protest since now that the Chinese populace is traveling a bit more(we're in Orlando and there are many PRC Nationals that like to vacation here for some reason due to the cleaner air) and see's how the first world although not perfect does generally have better air. 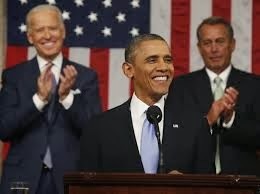 We feel based on Mr Obama's State of the Union this week that we can do an updated blog post on this topic. "It’s not just oil and natural gas production that’s booming; we’re becoming a global leader in solar, too. Every four minutes, another American home or business goes solar; every panel pounded into place by a worker whose job can’t be outsourced"
"One of the reasons why is natural gas - if extracted safely, it’s the bridge fuel that can power our economy with less of the carbon pollution that causes climate change. Businesses plan to invest almost $100 billion in new factories that use natural gas. I’ll cut red tape to help states get those factories built, and put folks to work"
"And even as we’ve increased energy production, we’ve partnered with businesses, builders, and local communities to reduce the energy we consume. When we rescued our automakers, for example, we worked with them to set higher fuel efficiency standards for our cars. In the coming months, I’ll build on that success by setting new standards for our trucks, so we can keep driving down oil imports and what we pay at the pump." We will confirm what we said in our previous blogpost Mr Obama is very pragmatic because he does not want to lose the support of the Blue Dog top of the fence sitting Democrats that may not be too interested in environmental matters. He also is interested in keeping the economy going which is really his job. Of course the news this week that the NSA was monitoring communications at the Copenhagen Climate Summit a few years ago is a bit scary and at best shows a hedging by the Obama government to try and know what the other governments were to do before committing the USA to any type of climate policy.Those are definitely the actions of a follower and not a leader. Also things are pointing with the approval by the US State Dept this week that the Keystone Pipeline will most likely be approved and finished thus promoting the growth of tar sands oil which is horribly polluting. Would be interesting to see what Mr Romney would have said last week should he have been elected. Well for now we have Obama and we give him a Green grade so far of 70 on a 100 pt scale.